One of the biggest stories in Boston this week, which quickly spread to national media, is about a Harvard Business School instructor nagging a Chinese restaurant for being overcharged $4. While not directly about politics, the Case of the Shredded Chicken with Extra Price is a fine illustration of how easy it is to shape and set public opinion in a few hours. It’s also an example of the anti-intellectualism, and hostility toward scientific inquiry, that course through American society. This was all detailed in the sarcastic Boston.com story (“Edelman soon came to the horrifying realization that he had been overcharged. By a total of $4.”), which does not disclose how the reporter saw the emails—though it’s not hard to guess. The story mentions that Edelman “operates a consulting practice” with clients like Microsoft and the NFL. It does not mention that Edelman’s own website has links to his investigations of deceptive advertising, airlines that fraudulently itemize more than two-thirds of their fares as “taxes,” and websites that install unwanted software on computers through “security” holes. It’s a remarkably ugly website, by the way, with a head shot of a smug-looking Edelman on every page. The impression is that he gets very deep into the weeds on these matters and doesn’t put much thought into how the impression he’s making on others. Posting this story on Facebook or Twitter serves as a way to cement one’s identity on those sites; an editorial note saying that Edelman is “terrible” or “a complete tool” reveals what side of the debate has been taken by the person posting it. A post that’s disdainful toward Edelman serves as a proxy for saying “I would never enter into a nitpicky customer-service match, or at least, not one as drawn-out as the one that Edelman and Duan engaged in here”; being slightly more lenient toward him indicates a rules-are-rules outlook. Stories like this one extrapolate everyday annoyances, turning real life into not just entertainment, but a bit of self-branding similar to a button or a T-shirt. I’ve seen barely any defenders of Edelman, and I don’t think his gadfly activities line up with the authoritarian connotation of the phrase “rules are rules.” His breaking of accepted rules of diplomacy and politeness are what got him in trouble. That, and a near-universal hostility toward an elite institution—which is somewhat understandable in an age when wealth and power seems to be flowing to fewer and fewer hands. On Thursday, Boston Globe columnist Joan Vennochi connected the dots between Edelman and another pointy-headed intellectual who’s in trouble for his lack of tact: MIT professor Jonathan Gruber, who was caught on videotape saying that the “stupidity” of the American voter eased the passage of the Affordable Care Act. Gruber has been indiscreet about the Obama administration’s strategy of downplaying the ACA’s goal of extending coverage to low-income individuals—a strategy that led to unrealistic promises that people already buying insurance on their own would not be affected by the law. (See “There Are Worse Things To Be Called Than Stupid.”) This Tuesday, Gruber appeared before a congressional committee to be raked over the coals by members of both parties, who routinely vote on bills with deliberately confusing language. Because of qualities that often breed arrogance—such as superior intelligence and exceptional talent—the arrogant are often in charge of the rest of us. But every once in awhile, circumstances force them to acknowledge their insufferable demeanor—and that can be delicious. True. But I’m also reminded of the Japanese proverb: “The nail that sticks out gets hammered down.” Neither Edelman nor Gruber are blameless for their public humiliations, but loose-cannon personalities are often associated with innovation and creative thinking. Edelman seems like a colossal pest, but his obsession with $4 here and $4 there could lead to all kinds of beneficial research. Did you know that he co-authored a Harvard Business School paper in February called “Digital Discrimination: The Case of Airbnb.com,” which presented evidence that “nonblack hosts are able to charge approximately 12 percent more than black hosts”? Maybe he was a jerk in getting the data for this paper; does that make the research invalid? Gruber, who helped to craft the Massachusetts law that was a model for the ACA, is an imaginative expert on health-care economics who has helped meet the once-bipartisan goal of covering almost all Americans while maintaining a private-sector insurance industry. (“What we’ve done now is fragment into a profession where many economists don’t touch the real world,” he said in a 2007 interview. Now he knows why.) The punishment for his braggadocio should not be to discourage the best academics from participating in public policy. It can be tough to tolerate such healthy egos in a democracy. It’s getting even tougher when it’s so easy to knock down know-it-alls on Facebook and Twitter. So far, there’s no evidence that these nonstop shaming exercises are improving civic life. 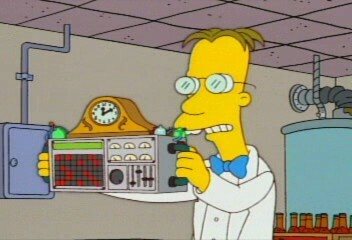 Screen shot of Professor Frink from "The Simpsons."